A No.8 of great ability, the 6ft 5in Sergio Parisse is not the heftiest player to occupy the back of the scrum at 17st 5lb, but his positional sense in the line-out and flair for getting across the gainline have marked him out as an outstanding player both for club and country. Unlike several other Azzurri internationals of recent vintage, Parisse's heritage is not a simple case of switching from Argentina, where he was born, to Italy for economic or rugby expedience. His father, also Sergio, played for the L'Aquila club with whom he won the Italian club championship in 1967 before his job with the Alitalia airline took him to Argentina in 1970. Sergio junior was born in 1983 and played his early rugby for La Plata. His family spoke Italian at home and every year Sergio would go on holiday to Italy. Parisse moved to Italy and joined Treviso where he played for four years before signing for Stade Français in Paris in 2005. While with Treviso he was capped at the age of 18 by then Azzurri coach John Kirwan, in a 64-10 defeat to New Zealand in Hamilton in June 2002. Parisse scored his first Test try against Canada in the 2003 World Cup and his second in a 30-29 win over Argentina in Cordoba in June 2005. Though Italy failed to make it beyond the pool stage at the 2007 World Cup, Parisse played well, and continued his form into the 2008 Six Nations. He was said during 2007 and 2008 to be a possible signing for Leicester Tigers in England but was content at the time to stay put with Stade alongside fellow Italy stars Mauro and Mirco Bergamasco. 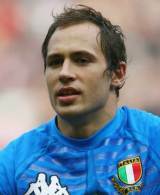 In September 2008 Parisse was nominate for IRB Player of the year alongside Dan Carter, Wales pair Ryan Jones and Shane Williams and Scotland scrum-half Mike Blair. On tour to New Zealand in 2009 Parisse damaged his public image by being banned for gouging, picking up na eight week suspension in an incident involving Isaac Ross. Following his return he again returned to good form, but missed the 2010 Six Nations with a serious knee injury. His playing return was also his Test return as he scored a try in defeat to South Africa in Witbank on tour the following June. He was subsequently named as Stade Francais skipper for the 2009-10 season. Parisse has since opted to stay with the French giants despite overtures from abroad and also within France. He is widely perceived to be one of Europe's premier No.8's and started all of Italy's games during the 2011 Six Nations and managed to bag a try against Wales. He featured prominently for Italy during the 2011 World Cup and the following Six Nations but Italy failed to live up to expectation narrowly avoiding the wooden spoon in the northern hemisphere tournament. Come the 2012-13 season, Parisse's stock as one of the world's premier No.8s continued to rise and he was a key cog in Italy's memorable win over France in the opening match of the 2013 Six Nations.